GONE are the days when Malaysia had double internationals and those who represented states in several sports. Some excelled in both sports simultaneously, while others switched once they retired. Of course, we have evolved. These days athletes pursue sports fulltime and it involves specialisation. However, despite professionalism and specialisation, we fail to produce as many top athletes as in the past. But for the Kuala Lumpur SEA Games, we have one double international — women’s futsal player, Intan Sarah Anisah Zulgalfi — who was national back-up and state sprinter and 100m hurdler. Tan Sri Dr M. Jegathesan who won three gold medals — 100m, 200m and 4×100m men’s relay event — at the Bangkok Asian Games in 1966, agreed the situation is different. “Focus is on one sport. The sports calendar for each sport is almost year round,” said Jegathesan who competed in three Olympics — Rome (1960), Tokyo (1964) and Mexico City (1968). “I had to juggle my athletics career with my studies, but when I was in University Malaya, I was also sought to play rugby. “I went for trials but was not selected. The coach told me I ran fast, but I had to run with the ball as well,” laughed Jegathes​a​​​n. Veteran sports official Datuk Sieh Kok Chi said: “From 1950s to 1970s the sports season was quite defined and athletes could switch from one sport to another. “Today specialisation is from a young age and athletes are discouraged from taking up another sport. “I’ve tried to persuade some coaches to allow their athletes to change sports — sprinters can play rugby 7s, women basketball players can be good at netball and rugby 7s players and swimmers, runners and cyclists can be triathletes. V. Kalimutu, who was a double international in football and athletics and also played hockey, cricket and rugby at state level, had a different perception for the lack of sportsmen and women involved in multiple sports. “It has to do with our school system. Those days students were required to participate in several sports because we had inter-class and inter-house competitions. “Competition was keen and served as a talent identification process,” said Kalimutu a member of the 1972 Munich Olympics qualifying football team. “The better players from the competitions then get selected to play for school in inter-school competitions at district levels before progressing to national level. “As each sports was seasonal and played over a period of time, players developed. Now competitions are held on a carnival basis over a day or two. “While the idea of the the ‘one student, one sport’ concept, is to encourage students to take up sports, it is also thinning the base,” said the 71-year-old Kalimutu who is actively coaching football at grassroots level. A great deal to think about and debate, but at the end of day, despite Malaysian sports having moved with times to be specialised and keeping up with the professional era, the desired result is still under achieved. 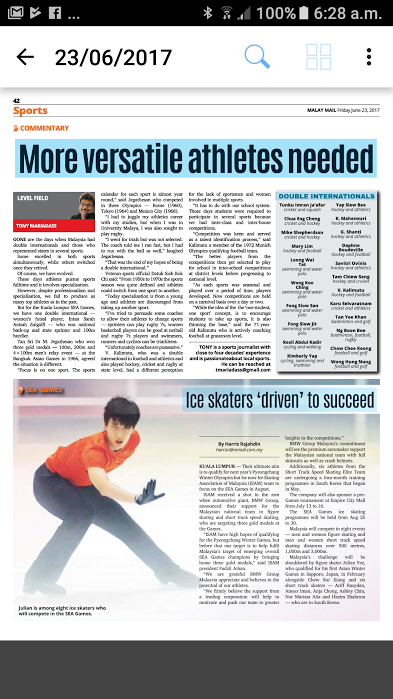 It is about time a majority of our Malaysian sports athletes step up and excel at the highest level instead of being contended with results at the lowest level of competition at regional level. With the kind money allocated towards sports, the facilities and experts at hand, athletes should be aiming to be best in Asia and be able to compete against the world’s best. · Shepherdson, (hockey and cricket). TONY is a sports journalist with close to four decades’ experience and is passionateabout local sports.